This timelessly elegant LED pendant luminaire in matt black aluminium housing is ideal for use in dry interiors such as offices, corridors, conference rooms, but also in shops, boutiques, hotels, restaurants, bars and much more. It is equipped with highly efficient SMD LEDs Type 2835 with an efficiency of over 100 lm/W. Due to the matt front cover, the bright light is very low-glare and is distributed at an angle of approx. 90°. The power supply unit is housed in the luminaire canopy and can easily be replaced in the event of repairs. Optionally, this lamp can be equipped with a 0-10V dimmable power supply for a surcharge. 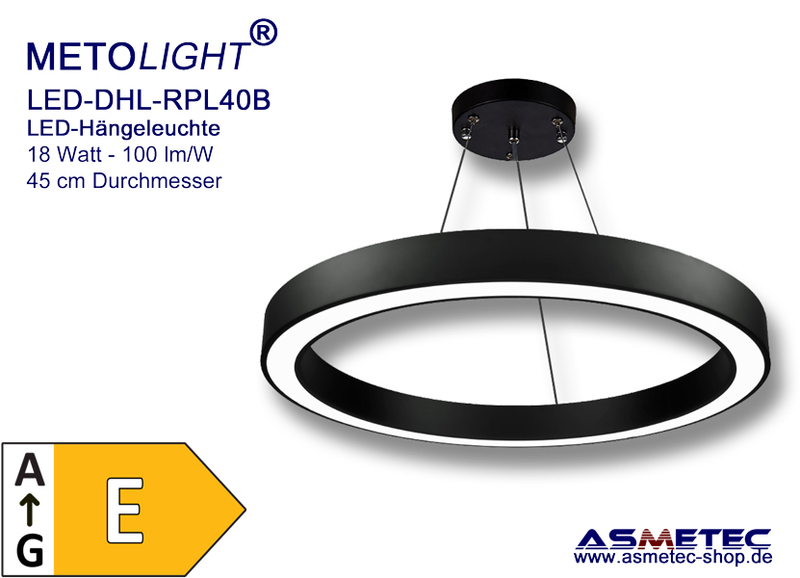 The luminaire body has an outer diameter of 40 cm and a frame height / width of 80 mm. As standard, we deliver this LED light color neutral white - 4000K, housing color black.